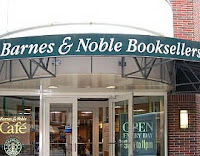 The Gowanus Lounge: Barnes & Noble Tells Mom with Crying Child It Was "Policy"
Barnes & Noble Tells Mom with Crying Child It Was "Policy"
I just had the oddest phone conversation with a supervisor from B&N customer service. Apparently B&N customer service not only read the email I sent them but read the posts and responses on Park Slope Parents. I received an email asking me to call a customer service supervisor at their 800 number. I called and was surprised to find out that the she wasn't interested in apologizing or explaining the store manager's actions but rather in pointing out that I had disrupted their business (i.e. because my questions held up the line although there were, I think, two people in line and at least three cashiers working at the time) and that this was, according to B&N policy, grounds for throwing me and my son out of the store. It seems to me that B&N was throwing out a person who was intentionally trying to subvert the return policy, not simply because there was a crying child. Continuing to refer to the event as a 'mother and child being thrown out' just contributes to the ridiculously misguided sense of injustice here. I'm with a previous poster (beginning of the week) who felt they would go crazy managing that store. It's a retail establishment, not a gymboree.